For my husband’s 40th I wanted to plan something really special to celebrate this milestone with all of our family and friends. I have been wanting to do a Gatsby theme for a while now and this was the opportunity. 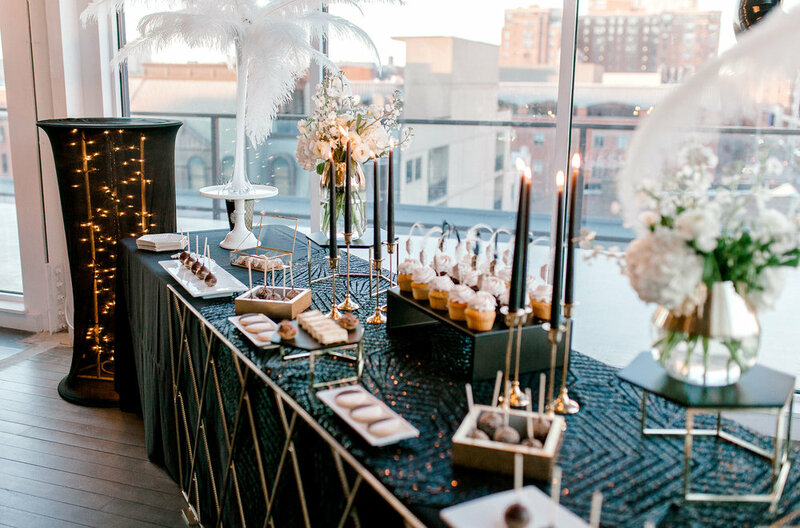 Gold, glitz, feathers, and roaring twenties flair sparkled all over the venue. We selected Antique Loft in Hoboken, NJ coupled with Antique Bakery’s catering for the event. Antique Loft recently opened and offers amazing NYC views and a wrap around terrace. The venue is approx 4000 SF. The incredible James Calleo performed with an acoustic trio. Later in the evening, my husband Stephen, who is a self taught guitar player got up with band and made his live debut. At the bar, we offered signature cocktails such as a Gin Rickey and a spicy blood orange margarita. The Gatsby 40th was a night to remember. Art deco sequin overlays, black candles and feather centerpieces enhanced the already stunning venue. And then there were the outfits. Our guests did not disappoint and really embraced the theme with their feathers and fringe. Thanks to all for making Stephen’s fortieth fabulous!